Seller will give you a gift certificate in the amount of 4,485 RUB for a positive review of the product purchased. 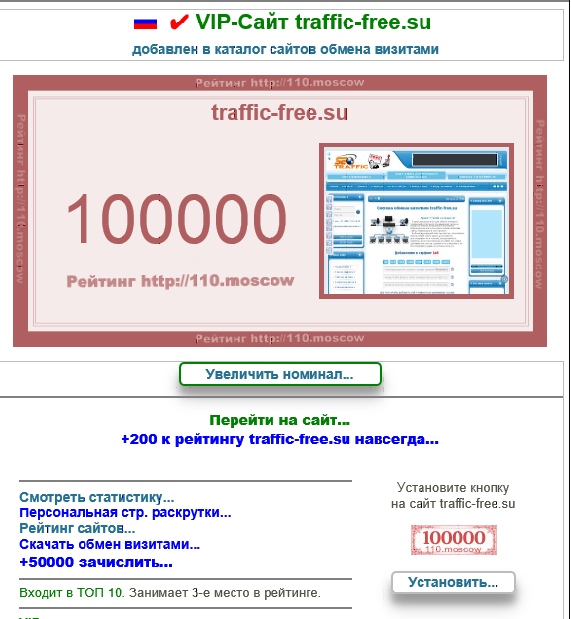 You will receive a pin-code to instantly increase the rating of any one site in the directory 110.moscow. The site will always get vip-shows. The term for increasing the rating is forever. To increase the rating of another site, please repeat the purchase of the code! The previously activated pin codes are added together. Attention! Only sites that do not comply with the rules of the catalog and are listed in the black list can be deleted from the catalog! Seller will give you a gift certificate in the amount of 4,485 RUB for a positive review of the product purchased..